Pets Do All The Work... Not You! Fresh flavors of alfalfa (source of chlorophyll), cinnamon, vanilla and clove help freshen breath. Outside ridges help abrasive action. Ark's patented toothpaste center for plaque, tartar and bacteria control. 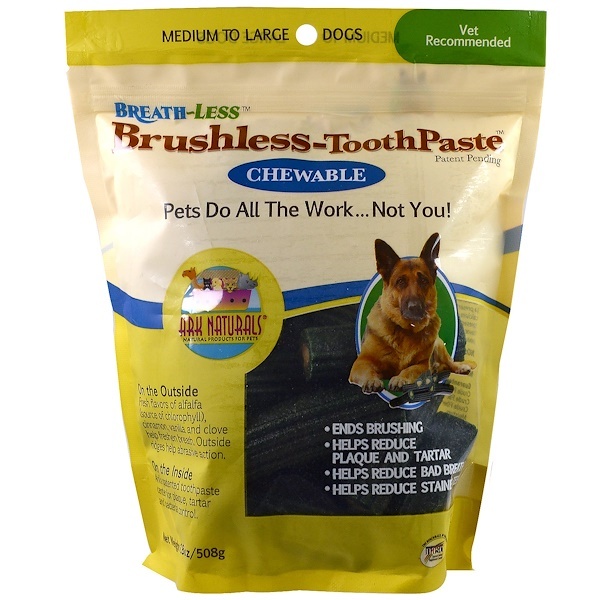 Now Your Pets Can Help Care For Their Own Teeth! Ends: hand brushing, wipes, sprays, gels, paste and jumpy pets. Helps reduce: plaque, tartar, bad breath and stained teeth. L-ascorbyl-2-polyphosphate (Stay-C) helps to support dental health. Sodium bicarbonate and calcium carbonate help abrasive action. Alfalfa (source of chlorophyll), cinnamon, vanilla, clove all help freshen breath. More than just a treat. Great tasting. Easy to chew. Easy to digest. Arks Naturals products are formulated and recommended by Dr. Nancy Scanlan DVM and Dr. C. Leigh Broadhurst PhD. All Ark products are for pet use only. Our ingredients are GMP (good manufacturing practices) compliant. Breath-Less APHIS/USDA facilities. Proud members of the NPA, APPA and NASC. 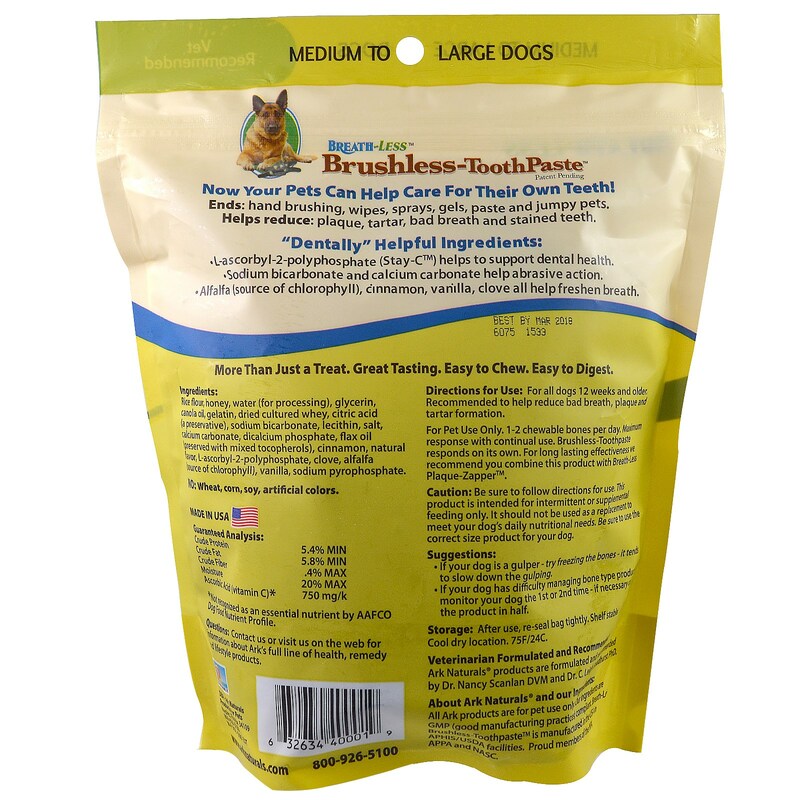 For all dogs 12 weeks and older Recommended to help reduce bad breath, plaque and tartar formation. For Pet Use Only. 1-2 chewable bones per day. Maximum response with continual use. Brushless-Toothpaste responds on its own. For long lasting effectiveness we recommend you combine this product with Breath-Less Plaque-Zapper. If your dog is a gulper - try freezing the bones - it ends to slow down the gulping. If your dog has difficulty managing bone type products - monitor your dog the 1st or 2nd time - if necessary cut the product in half. Rice flour, honey, water (for processing), glycerin, canola oil, gelatin dried cultured whey, citric acid (a preservative), sodium bicarbonate, lecithin ,salt, calcium carbonate, dicalcium phosphate, flax oil (preserved with mixed tocopherols), cinnamon, natural flavor, l-ascorbyl-2-polyphosphate, clove, alfalfa (source of chlorophyll), vanilla, sodium pyrophosphate. No: Wheat, corn, soy, artificial colors. Caution: Be sure to follow directions for use. This product is intended for intermittent or supplemental feeding only. It should not be used as a replacement meet your dog's daily nutritional needs. Be sure to use the correct size product for your dog.